The KV-S7075C-V scanner comes bundled with Kofax VirtualReScan Software to provide an all in one winning solution. Now you can consecutively scan ADF and flatbed documents in one simple operation, greatly improving your productivity. 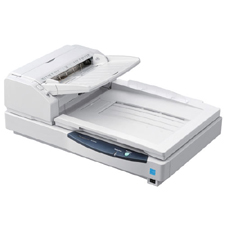 The high-speed KV-S7075C dual-document color scanner, which combines 95 ppm/190 ipm productivity with the flexibility of twin document feeders — a 200-sheet ADF for normal one-sheet originals and a flatbed for scanning books, magazines and thick documents such as passports and appointment calendars. Advanced features of the KV-S7075C include high-efficiency consecutive scanning of ADF and flatbed documents, automatic separation of scanned images from two-page book, magazine, and other bound-volume spreads into discrete single-page electronic sheets, fast, accurate scanning of EKG monitoring sheets and similar long documents, multi-cropping for single-pass scanning of different-sized small items, and mixed document feeding with user-selectable page alignment. The Industry’s Fastest Flatbed Scanner!